The exposure each diamond procures from a micro-prong setting allows the gemstone to sparkle from every angle. Match these rings with any engagement ring style for a shimmering look. Diamonds sparkle to the best of their ability given the proper amount of light refracting off their delicate, chiseled surfaces. Allowing the diamonds on your darling wedding band the space to shine and absolutely wow onlookers with their astounding capabilities is a top priority at Icing On The Ring. A micro-prong setting provides the ample amount of exposure to each diamond, shining and shimmering in every which, way, or form. Having a micro-prong wedding band means ensuring the safety of your marvelous matrimonial diamonds. 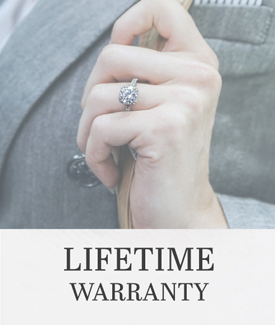 A micro-prong setting on a band safeguards each and every diamond in a separate setting of its own in a durable manner guaranteeing the longevity of the diamond wedding band. The micro-prongs hold each diamond carefully away from the band supplying the diamonds with an abundance of sunlight to echo extreme colors and shine in the most superlative style. This method of cultivating eternity wedding rings is for an endless amount of shimmers. Personalize your forever wedding band with an engraving on the inside of the band for that extra special touch. The rings for women are available in a variety of precious metals such as white gold, yellow gold, rose gold, and platinum. Micro-prong diamond wedding bands span an eternity on various precious metal choices, creating an aura of a never-ending iridescent presence. Not only are micro-prong diamond rings the most alluring and appealing to an audience, they are also a safe and secure means of inheriting a wedding ring for a multitude of generations to come. Protect your future and astonish your bride-to-be with a micro-prong wedding ring from Icing On The Ring. A twist on the traditional micro-prong wedding band, the interweaving 14k yellow gold strands create a braid halfway through the body that makes it great for a wedding band or fashion stackable.